It was just over a month ago that I posted about the arrival of fresh hop season. While offerings were a bit limited and sporadic at that point, right now there is great fresh hop beer pouring all over town. Check out the updated list of events and tappings below. My wife & I made it back to the Yakima Fresh Hop Fest this past Saturday for the first time since 2008 (pics here). Back then, the fest was less of a feature for fresh hop beers and more just a big old party for locals, at least that’s what it seemed like to us. 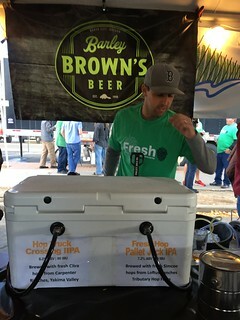 Several breweries pouring at the fest at that point didn’t even have fresh hop beer and were just offering their regular lineup. But, the festival has certainly evolved and now rightfully has its focus squarely on the special fresh hop beers of the season that make Yakima and the NW such a special place to be this type of year. There were lots of great beers. Too many to list, but a few that I had not tried around Seattle that stuck out to me were: Bale Breaker/Cloudburst Citra Slicker, Fat Heads Kinda Is, Barley Brown’s FH Pallet Jack (yes! ), Black Raven FH Pale Ale (1st time I’ve really liked a FH beer from Black Raven) & Ninkasi Total Crystalation (better than I remember from previous years). I was bummed to miss out on the pFriem Citra Pale, which blew just as I walked up to it. I was looking forward to trying the Holy Mountain/Cloudburst Wet Wired collaboration, but the line was insane. They also had a bike going around the fest pouring special beers (fresh hop and not), and I enjoyed the hell out of my mostly-full pint of Founder’s Breakfast Stout for a single ticket. Overall, the atmosphere and selection at the Yakima Fresh Hop Fest are something that every fan of fresh hop beer should experience at least once. With so much great beer around Seattle, there is no need to go every year, but it makes for a great road trip. You can also combine the fest with a visit to Bale Breaker, Snipes Mountain and other breweries in the area. Continues through October 9 with 25+ taps devoted to fresh hop beers. Check out their live tap list to see what is pouring. Slow Boat will be rotating fresh hop beers for the next couple of weeks, and they are starting things off today by pouring Reuben’s Amarillo Pale, Flying Lion Simcoe Pale, Cloudburst Water Weight, Double Mountain Killer Red, Ecliptic Amarillo/Simcoe Pale, Alpine DIPA and Breakside FH Wanderlust. This collaboration fresh hop from Bale Breaker and Cloudburst was one of my favorite in Yakima. Also on tap: Cloudburst POM POM IPA, Cloudburst Boom Roasted!, Bale Breaker Triple IPA X (infused with peaches) and Bale Breaker Piled High Fresh Hop IPA. Cost is $5 and includes a taster glass of all 3 of our new Fresh Hop releases. Join the brewers for a tour of the brewery and tasting right off of the tank! This just in! Andrew has made a super secret special Fresh Hop beer that will be included in the tasting as well! A new festival for 2016 that will feature fresh hop beers from 20+ breweries. Featuring: 20 Corners Brewing, Bad Jimmy’s Brewing, Counterbalance Brewing, Diamond Knot Brewing, Double Mountain Brewing, Elysian Brewing, Flycaster Brewing, Fremont Brewing, Ghostfish Brewing, Hales Ales, Kulshan Brewing, Lowercase Brewing, Locust Cider, Lucky Envelope Brewing, Microhops, Northsound Brewing, Outlander Brewing, Postdoc Brewing, Schooner Exact Brewing, Scuttlebutt Brewing, Seattle Cider Co., SnoTown Brewing, Two Beers Brewing, Triplehorn Brewing, Widmer Brewing, Woodinville Ciderworks and more breweries TBA Soon! Populuxe will release three fresh hop beers starting at noon: Fresh Hop Citra Pale Ale, Fresh Hop Mosaic IPA and Fresh Hop Sim City Simcoe DIPA. Then at 6 PM, local legends Kurt Bloch (Fastbacks, The Young Fresh Fellows, Thee Sgt Major 3, etc etc) and Jim Sangster (The Young Fresh Fellows, TRIPWIRES,Picketts, etc etc) will be spinning 45’s both Classic and Not So Much! R&B Raunch, Solid Soul Senders, Saucy Surf, Crunchy Garage, Loud Sounds both Rock AND Roll, and perhaps a dose of Classic Punkers! Music that pairs well with beer presented with panache and verve from well patina’d seven inch platters that matter! Chavoya’s Hot Dogs will be serving up franks and Balleywood Creamery will have specialty ice creams including Fresh Hop ice cream. Fremont is putting out a rotating series of Fresh hop beers, dubbed the Field to Ferment, throughout the month of September. One each week for the month of September. We are going to hold on to one of each and tap them on this day— we are hoping to have some surprises as well. Skookum Brewer’s Night – Or lets celebrate Washington Fresh Hops—the details on this are still being figured out. Details to come but expect an event on this day. 4 hoppy sours from Almanac, in addition to New Belgium Le Terrior and some Mikkeller hoppy sours. Also, I sporadically like to search on Twitter for “fresh hop” to see what people are saying. You should give it a try. All the non-beer tweets that combine “fresh” and “hop” are pretty entertaining.